Mr. Chairman, Mr. Sensenbrenner, members of the Select Committee, thank you for the opportunity to testify on the topic of what the federal government should be doing to adapt to climate change. My name is Stephen Seidel and I am Vice-President for Policy Analysis at the Pew Center on Global Climate Change. U.S. temperatures have increased by more than 2 degrees F. over the past 50 years. Average global sea level has risen by 8 inches over the last century. The amount of rain falling in the heaviest downpours (the heaviest 1%) has increased by 20 percent over the last century. Arctic sea ice is declining dramatically – end of summer ice losses have averaged 11% per decade over the past three decades. The changes we’ve experienced to date are likely to increase dramatically over time. In fact, one of the unfortunate aspects of our climate system (due to built-in lags such as absorption of heat by the oceans) is that even if we could wave a magic wand and totally stop emissions of greenhouse gases immediately, global average temperatures would increase by another 1 degree F. If we continue on our current path and global greenhouse gas emissions continue to increase, temperatures would further rise, for a total increase on the order of 7-11 degrees F. by 2100. We must take action to reduce greenhouse gas emissions to limit both the rate of climate change and the ultimate magnitude of that change. The second point is the focus of this hearing and of a study that the Pew Center2 undertook to explore what the federal government should do to provide leadership to our nation in its effort to more effectively adapt to climate change. Agriculture – what, where, and when we plant depends on temperature, length of growing season and water availability. Community development – what we build and where we locate structures and development depend on such factors as the availability of water, temperatures, risks of wildfires and coastal impacts. Energy development – many sources of electricity require large amounts of water for cooling, and different types of renewable energy depend critically on the availability of stream flows, sunlight or wind. Public health systems – are designed to anticipate and treat different types of diseases whose geographic ranges and seasonal occurrence may be influenced by climatic conditions. Emergency response systems – are designed around the likelihood and magnitude of extreme weather events (e.g., storms, floods, drought, and heat waves). National security – growing recognition among security experts that climate change, such as extreme weather events, scarcity of food, coastal flooding, etc. can contribute to increased tensions. Natural resources – the habitat for plants and animals, the viability of forests and the health of wetlands are all affected by temperature and the availability of water.It should be clear that the impacts of changing our climate cut across a broad swath of our economy from food to energy production, to where and in what we live and how we travel, to the wellbeing of our natural resources and even to our national security. And that critical assumption – that future climatic conditions will be similar to the past – moves further and further away from reality with each ton of carbon dioxide we add to the atmosphere. Damages from climate change are often discussed in terms of the impact that an average change in temperature or precipitation could cause. Yet we know from real life experience that the occurrence of extreme events (such as heat waves, floods, and intense storms) is what drives economic losses. We also know that one of the insidious aspects of climate change is that the number of extreme events is expected to increase dramatically. For example, under a scenario where emissions continue to grow uncontrolled, the number of days over 90 degrees in the Southern United States would increase from 60 per year to 150 per year by the end of the century.3 With a one-half meter rise in sea level, the maximum level of flooding that New York City used to experience once every one hundred years would occur once every 25 years. The federal government owns 29% of all lands in the country. It owns 476,000 public structures including bridges, tunnels, and flood control structures that are valued at $723 billion. The Department of Defense alone has vast holdings many of which are in coastal areas. Naval bases are of course at sea level, but so are many Air Force bases and training bases such as Camps Pendleton in southern California and LeJeune in coastal North Carolina. Many of our prized national parks are also vulnerable to the impacts of climate change and key features of some such as the Everglades and Glacier National Park could mostly disappear or be substantially changed. To properly manage these assets it is critical that the federal government understand the risks posed by climate change and the opportunities to adapt in a timely and cost-effective manner. The federal government influences many decisions made by state and local governments and the private sector. The federal government is involved, directly or indirectly, in setting air and water pollution control regulations, in transportation and water infrastructure planning and design, and in design and siting of hydroelectric and other energy facilities. Other federal programs, such as the national flood and crop insurance programs, also play a major role in decisions that are affected by climate change. The federal government provides critical information and technical support in areas related to climate and its impact. Weather information and hazardous conditions advisories are part of the daily fabric of our lives. The federal government’s technical expertise is also made widely available through such mechanisms as the National Climatic Data Center, the Agricultural Cooperative Extension Service, the National Institute of Standards and Technology, federal land and forestry managers, and the Public Health Service. Federal leadership in each of these areas is critical. If properly directed these and similar resources across the federal government can become important cogs in a national effort to adapt to climate change. Moreover, these same resources could play a significant role in both assisting state and local governments and the private sector in their adaptation activities. We recommend a comprehensive review of federal activities aimed first at identifying assets, programs and activities most at risk from climate change and then making the necessary changes to enhance resiliency. Above all, we recommend that recognition of our changing climate be “mainstreamed” across all relevant federal programs. Nowhere should the federal government continue to assume that our future climate will be the same as the past. In analyzing how to structure a federal adaptation program it quickly became clear that one frequently used approach would not work. Adaptation is not the type of new issue where it would make sense to set up a new office or department and charge it with tackling the problem. It must be integrated into the everyday decisions of program managers across a wide spectrum of climate-related activities. Coastal zone managers must begin taking sea level rise into account when planning new development or shoreline protection. Agricultural agents must begin thinking about changes in growing seasons, temperatures, and water availability when deciding on seed selection or crop rotations. Land managers must consider fire risk changes resulting from shifts in precipitation, or damage to forests due to pest infestations (such as bark beetle infestations). Transportation planners must consider flood hazards when designing and locating new roads or bridges. None of these are new decisions, but each must be viewed with a new perspective – that future climate will be altered. Only by “mainstreaming” adaptation considerations across all relevant programs will our nation be in a position to meet the challenges of unavoidable climate change. Based on a review of adaptation programs initiated by other countries and by state and local governments in the United States, we have developed the following recommendations. The good news is that several agencies have taken the first step down this path. In January 2009, the Secretary of Interior issued an order requiring bureaus and offices to “consider and analyze potential climate change impacts when undertaking long-range planning exercises, setting priorities for scientific research and investigations, developing multiyear management plans, and making major decisions regarding potential use of resources under the Department’s purview.” The order goes on to require that offices identify legal barriers, resource needs and recommended actions to respond to potential climatic impacts. In September 2009, this order was supplemented by the creation of Climate Change Response Councils and regional response centers to facilitate information sharing and response strategies across the Department. Within the Department of Interior, the U.S. Fish and Wildlife Service released its climate change strategy and five-year action plan in September of 2009. EPA’s Office of Water has also has issued a strategic plan to address the impacts of climate change on its programs. This requirement could serve as a lynchpin for initiating an effective strategic planning process within agencies. Even before the executive order was issued, CEQ had been working with an interagency group identifying actions that could be taken to begin developing both agency and sector-specific strategic plans. These are encouraging initial signs of executive office leadership, but follow-up will be critical to ensure that agencies are committed to pursuing the internal engagement required for an effective planning and implementation process. We fully recognize that in developing their strategic plans, agencies are likely to identify a number of key areas where program responsibility is shared with other agencies and with state and local entities. We believe that an important next step in the planning process is to identify areas where sector-specific plans are required. Such areas as water resources, land management, human health, ecosystem protection, and coastal protection are examples where multiagency efforts with strong stakeholder participation will be required. Finally, we believe that over time it would be useful and possible to combine agency and sector plans as key building blocks in the development of a national strategic plan. The national plan can help provide strategic direction, set priorities, and identify key milestones. This can best be done based on the content of more detailed plans (bottom-up) rather than be developed first (top down). A key requirement for adapting to climate change is the availability of information detailing what those changes are likely to be. In addition, technical support in how to use such information in decision making on adaptation will be critical. A national climate service would be the entity responsible for developing and communicating credible and actionable climate scenarios and projections for use in adaptation planning purposes. In every case study we examined, one of the first questions asked was what temperature change, sea level increase, or change in precipitation should we assume as the basis for our adaptation planning. Given the local scale at which these questions are being asked and the uncertainty about important aspects of predicting future climate change, particularly at that scale, providing useful information is not a trivial matter. Many state and local entities have turned to nearby university experts as a source for climate scenarios. This has worked well in many cases, but the idea of making useful and consistent climate information widely available on a national basis has attracted attention for many years. The leading proponent of a national climate service has been the National Oceanic and Atmospheric Administration (NOAA). As a lead federal agency in developing climate observing systems, data analysis and predictions, NOAA has the scientific foundation upon which a national climate services could be constructed. It has undertaken an extensive process examining different ways to structure such an entity and has begun moving forward in its development. In our review of how a climate services might be structured we divided the function into two key parts: the development and provision of the climate data and the support required by the user community (such as coastal managers, water planners, agricultural agents, and transportation planners) to effectively identify their needs and use the information provided. We found that NOAA could most effectively lead the first element but not necessarily the outreach and user community engagement. To effectively engage the critical and diverse user communities, we believe a national climate services should involve other key federal agencies as sector working group leads. Figure 1 shows the proposed organizational structure. For example, the Department of Agriculture could lead a sector working group for the farm community and the Department of Interior could lead a sector working group on natural resources. The sector working groups would be responsible for fully engaging state and local entities, the private sector and other stakeholders in identifying the needs for information and decision support tools specific to their sector, in setting priorities and in communicating information to the sector. Our analysis focused on how to integrate an adaptation program into other climate related program activities across the federal government. We examined the two programs that currently exist – the Global Change Research Program (GCRP) and the Climate Change Technology Program (CCTP). Both are established by statute and we would recommend that a national adaptation program also be established by legislation. Because of the desirability of executive office leadership, we recommend that the national adaptation program be chaired or co-chaired by CEQ or the Office of Science and Technology Policy. The program should be managed by a coordinating committee that is made up of senior policy officials from each of the relevant agencies. We also recommend the creation of a small program office (along the lines of the office created under GCRP) to coordinate the agency and sector strategic planning activities. To ensure that adaptation is considered in all major federal actions, we recommend issuing clarifying regulations under NEPA. These regulations would make it clear that climate change needs to be considered in the planning stage of any major federal action. CEQ is responsible for NEPA’s implementation, while EPA’s Office of Federal Activities reviews environmental impact statements. We suggest establishing an interagency working group to prepare the proposed regulatory changes and to develop guidance for agencies in preparing EISs. The American Clean Energy and Security (ACES) Act passed by the House of Representatives in June of this year contains several provisions to address the issue of domestic climate change adaptation. While we we were pleased to see an adaptation section in the bill, we believe there are at least two important improvements that should be considered. First, the development of adaptation strategic plans for all relevant federal agencies is a key component of improving our nation’s resiliency to climate change. As currently written, the ACES Act only contains provisions for natural resource agency adaptation plans and a public health strategic plan. 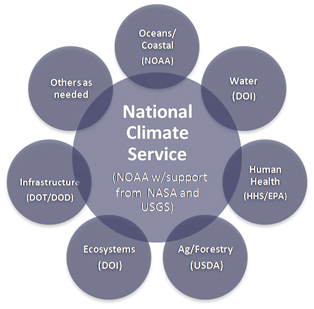 Second, although the ACES Act does contain provisions establishing a national climate service within NOAA, we would recommend a structure similar to the one outlined above that both provides for a central role for NOAA, but also more effectively engages other key agencies as sector working group leads. In conclusion, I would like to thank the Chairman, Mr. Sensenbrenner, and the members of the Select Committee for their time and attention to the important matter of furthering the U.S. government’s efforts to address climate change adaptation. 1. Global Change Impacts in the United States, Thomas Karl, Jerry M. Melillo, and Thomas C. Pederson, (eds.) Cambridge University Press, 2009. 2. The Pew Center on Global Climate Change will be issuing a report before the end of the year detailing its analysis of the federal role in adaptation. Supporting the Pew Center in this research has been Stratus Consulting and Terri Cruce, an independent contractor. 3. Karl, Melillo, and Pederson (eds. ), Climate Change Impacts in the United States, pg. 34.